"Healthy, easy and oh-so yummy! A favorite in Chinese restaurants." Wash prawns thoroughly and leave on shells and heads. In a bowl, mix the soy sauce, garlic, and brandy. Arrange the prawns on a dish, and cover with the soy sauce mixture. Fill a pot or wok about 1/2 full with water. Place a steamer basket over the water, and bring water to a boil. Place the dish with the shrimp onto the steamer basket. Cover wok, and steam prawns for 10 minutes, until opaque. Serve hot. 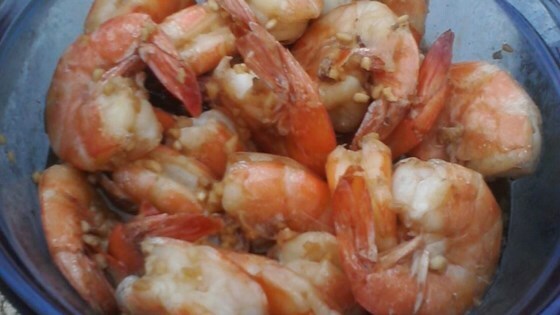 Make elegant but easy garlic shrimp in a white wine and butter sauce. Any way wat is brandy??? These were amazing! ...and so simple!